Did you ever wonder what you, as a Human Being in human form, is made of? What you organs and bones are made from? To understand this we need to go back to the beginning of the Universe as we know it. As mentioned in the recent blog post The Big Bang! the universe expanded rapidly after the big bang but it was only for a few seconds, and then it began to cool. It cooled to a state where subatomic particles began to assemble into atoms. Under extreme temperatures, the atoms’ nuclei move so fast that they hit one another and become one, ie. fuse. When they move more slowly, at lower temperatures, the proton nuclei repel one another, but at great speed when the hydrogen atom’s nuclei or two protons fuse, they form a nucleus consisting of two protons. This fusion also creates a great deal of Light energy. Now, without wanting to over simplify nuclear physics, the hydrogen (1 proton) fuses with Helium (2 protons) which together with the Light energy forms Stars. 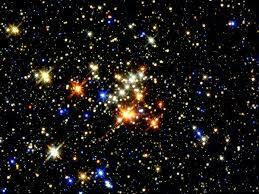 Stars shine because of the fusing atoms release of energy. As stars ages (including our sun) they continue to fuse, eg hydrogen with helium to form lithium (3 protons in its nucleus) and this process of fusion persists and creates even larger nuclei. This continues up to 26 protons — albeit in random order – and creates Iron, which is the largest element produced by a Star. The volume of energy released becomes smaller as the atoms grow in size, and elements with more than 26 protons no longer release energy, and therefore fusion is no longer possible. At that point, when fusion stops the core begins to cool down, and whereas previously the extreme heat of the core erupts from its center outwards preventing gravity from collapsing the star, this no longer happens and the Star implodes. The exploded remnants of the supernova then voyage through the Universe until they coalesce to form planets and new stars, ie. they clump together with other exploded supernovas giving birth to new stars. But you ask, well what does this have to do with me, and how human beings are formed. And what does this have to do with Spirituality and spiritual coaching. Well, good questions!! Well a single cell consists mainly of elements (such as carbon, hydrogen, oxygen and nitrogen) all coming from Earth, for example a plant takes these elements from the soil and the air, and animals get it from plants. So the elements from the soil, which came from stars, ultimately ends up in each of our cells. Just how the atoms that landed on our planet went from non-living to living remains an unanswered question in science. The human body, in human form, comprises of billions of these atoms, and while most of them are hydrogen atoms (the same hydrogen atoms created in the big bang) many others – around 40% — are atoms created from fusion…..created at some point in time from the Stars. And – even tho over 60% of the human body is water – since the Stardust atoms are heavier than Hydrogen atoms, around 90%+ of our body is stardust. Our skins, our organs, our bones………….the iron in your blood, the calcium in your bones, the carbon in your genes – were all created in a star billions of years ago. “It’s all alive!” Love hearing that connectedness!